What is a DevFest ? DevFest is an annual developer-focused event that GDG (Google Developer Group) chapters organizers worldwide. In this annual event, the latest technologies from Google are presented and discussed. DevFest purpose is to educate respective local developers on the opportunities ahead of them in new sunrise technologies. What is happening at this event ? GDG Singapore will organize our 4th annual DevFest on Oct 25 2014. 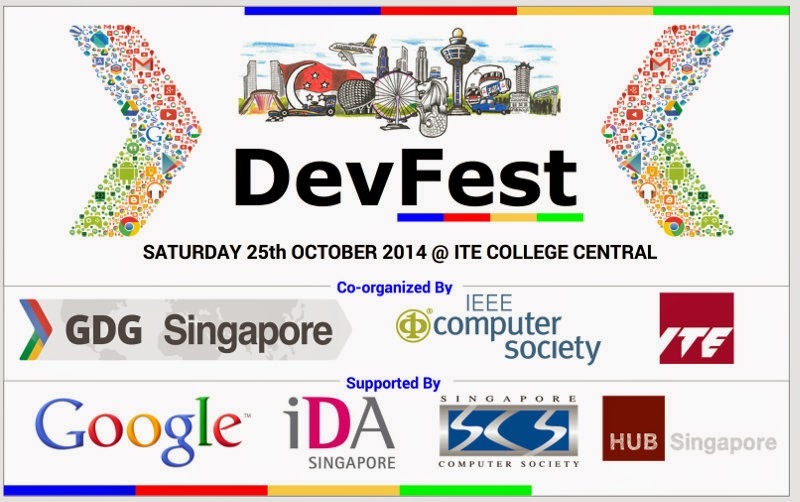 The focus of this year's DevFest is on new and upcoming wearable market. We plan to cover several aspects of wearable development including User Experience (UX) based design, introductory software development, cross-platform UI development. We will also be covering the latest developments in Google Cloud Platform that is typically used as a scalable backend for user-centric devices such as Android Wear, Glass, Phones and Tablets. GDG Singapore believes that wearable has a big opportunity for Singapore-based developers, startups and enterprises. In order to maximize the impact, this event is co-organized with IEEE computer society (Singapore chapter) and ITE. Various partners including Singapore Computer Society, The Hub Singapore, Startup Grind, Big Data user group and other new media channels support GDG Singapore DevFest 2014. Supporting organisations include IDA and Google. What are the primary audience ? The primary audiences for a DevFest are software developers, UX designers, Project leaders and managers who are keen to learn more about new Google technologies. Who are the speakers and what are they presenting ? We have secured 9 speakers for this DevFest and in total they will be presenting 10 presentations. The speaker associations are provided within “()” and the respective topics are provided after '-'.